Today is National Regifting Day. Remember that "interesting" office party gift you got last year and never opened? No worries - it's still good! Give that "wonderful" gift to someone else this year! Fruitcake anyone? 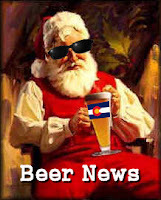 Here's what's happening around the Colorado beerosphere today Thursday, December 22nd, 2011. Crystal Springs Brewing (Boulder) just released their the first of their "Very Limited Release" series - a Christmas beer - Grandpa Claus' Spiced Ale. Its an amber ale with orange blossom honey added and spiced with sweet orange peel and cassia cinnamon. Its named after Tom Horst's Grandpa Claus (yes, his real name). You can find it on tap at Pizzeria Locale this week and at The Kitchen Upstairs next week. Then it'll be gone! Next up, will be a limited release of a special chili beer. Brewed with poblano chili peppers grown and roasted locally by a friend of the brewer. Its not too hot but picks up the wonderful flavors of a roasted chili pepper. Last of all, their port barrel aged Imperial Stout will be ready by early February. Crabtree Brewing (Greeley) - It may be snowing hard today, but once the snow tapers off and you dig out, stop by at Crabtree Brewing tonight at 7:30pm for a special Release Party. Today marks the debut of the 4th beer in their 750ml Barrel-Aged Series - Stephanie's Oatmeal Raisin Cookie. This brew was aged for over 10 months in whiskey barrels with caramelized raisins - a perfect warming brew for a cold winter's day. Stop by and purchase a bottle of this limited release before it's gone. Location: 625 3rd Street in Greeley. Pateros Creek Brewing (Fort Collins) - Even snow won't stop them from putting out a new Outlaw tap today. This week's batch is a Pomegranate Kolsch. Come by ski, snowmobile or dog sled, but get down to Pateros Creek for a taste. They'll keep the heat going for ya. Avery Brewing (Boulder) - today is their 2nd straight day of tapping a new keg of Rumpkin. If you missed it last night or want to get more, Avery will be tapping another keg tonight at 5pm. Strange Brewing (Denver) - Hey Strange Brewing fans. Now for a limited time you can find their Cherry Kriek on tap at the Wynkoop in LoDo. This brew is in limited supply but can be obtained at the main brewery or at the Wynkoop while it lasts. Trinity Brewing (Colorado Springs) - Trinity's recent expansion will soon provide them with a lot more capacity for their own beers. Soon, the 20 taps inside the brewery will have four or five fewer guest taps and be hosting even more of their own brews. Growth has been happening much faster than anticipated. By summer 2012, Trinity plans to make their beers available at other local taps and in selected liquor stores. And if growth happens as fast as it is now, they will expand into a new or second site within another seven years. See the full story in the CS Indy. Butcherknife Brewing Company (Steamboat Springs) - Are you ready for the holidays? Butcherknife Brewing is! Their Brown Ale, Color Rojo (Red), Singleality (dry-hopped IPA), a split batch of IPA, Kolsch, Saison, and blonde ales are all chugging along in the pipeline. Also a special barley wine is nearly ready. Lots of these are earmarked for a Steamboat New Years Eve party - They are excited to serve Steamboat some delicious beverages! Opening in early 2012. Twisted Pine Brewing (Boulder) - Please come out and help Twisted Pine support EFAA today. They'll be donating 10% of sales all day as well as hosting a canned food drive for Boulder's Emergency Family Assistance Association. The person who brings in the most cans will receive a $25 gift card to Twisted Pine. Del Norte Brewing (Denver) - is having a party to celebrate the release of their Luminaria Bock on Saturday, January 7th. The party starts at 3pm and the Strange Americans will start on the main stage at 4pm. This is the first of many parties Del Norte is planning. Cost $15 at the door, includes: Souvenir pint glass, three pint tickets, live music and good times. Echo Brewing Company (Frederick) - This brewery is targeting an early 2012 opening in Frederick, Colorado and construction on their brewing facility is slowly coming along. They just posted 12 new photos of their construction on Facebook today. Check it out and see where you'll be getting some of your beer from in 2012. Location: 5969 Iris Parkway in Frederick. Christmas Day - A reminder: Colorado liquor stores are legally allowed to be open on Christmas Day. So don't forget to visit your local store and stock up on Colorado craft beer, mead and hard cider for the holidays early. New Belgium (Fort Collins) - Don't expect to hear where New Belgium is going to expand to just yet. A spokesman for New Belgium says a decision on where to build a second East-coast brewery won't come until late-January or early February now. I guess some decisions take as long as Congress to make. Equinox Brewing (Fort Collins) has another holiday themed firkin available today. At noon they'll be tapping Eclipse Brown Ale conditioned with lactose (milk sugar) and nutmeg... call it an Eggnog Brown! Also, today they're releasing Pazuzu Stout, a strong, 8.3% abv, hoppy American style stout. Local home brewers Rod and Anne Simpson won Hops and Berries' Hopularity Competition with this recipe and then came in and brewed it with Equinox. They'll be down there at 5pm for the release. Perfect for a chilly, snowy day! Dry Dock Brewing (Aurora) - Dry Dock has named their New replacement head brewer. It is Doug Hyndman. He's been at Dry Dock over a year and has experience at Green Flash, Ska and Rock Bottom downtown. Dry Dock also just brewed their Poor Richards Ale, just in time for its tapping on Ben Franklin's birthday in January, a Dry Dock tradition. Euclid Hall Bar & Kitchen (Denver) celebrates beer every day but January has been deemed Beer Month at the 14th Street temple of brew. Daily beer tappings at 5:00 p.m. feature new and unusual beers. Every Tuesday through the month we will showcase themed Beer Bites from 3:00 p.m. until closing. Three 2 ounce pours of selected beers paired with three bite-sized snacks from the Euclid Hall kitchen for only $12.50 in the bar. Whether your preference is Belgians, Sours, Hoppy or Dark, we've got a Tuesday theme for you. Euclid Hall Bar and Kitchen was just named one of the top 10 beer lists in America by Esquire magazine. Stop by 1317 14th Street, visit euclidhall.com or call 303.595.4255. See the full tapping list. Like what you see here? There's even more Colorado beer happenings on the Fermentedly Challenged Facebook page. Help us grow to 500 "Likes" by year's end! Don't miss another article. Subscribe to Fermentedly Challenged by RSS today.If you enjoyed this article, please consider sharing, retweeting, Stumbling or +1'ing this to let others know about it. Cheers!